A byproduct of the copper mine situated in Mineral Park Mining District, Kingman turquoise comes from an area of Arizona which had always been a large source of this precious stone. The area was first mined by the Indians and the modern turquoise production dates back to the early years of 1880 and it was James Haas who rediscovered the Kingman area mines. Kingman turquoise pieces are known for their bright blue shades and these nuggets had a fine matrix. When in its high-grade form, Kingman turquoise has a medium up to dark blue color and is flecked with either quartz or pyrite. 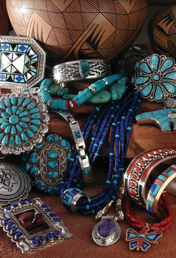 The high-grade pieces are some of the best quality turquoise, although not considered as rare. Today, the best Kingman pieces are of a deep blue shade with a black matrix�some even have a spiderweb pattern. It was in 1973 when the mine was supervised by L.W. Hardy of Kingman and they were able to produce 23,878 lbs., 54,818 lbs., and 4,344 lbs., each of green and blue chalk and gem-grade turquoise respectively.